Every region of Canada has unique geographic features, ones that set them apart from the rest. However, while that description also applies to our newest province – Newfoundland and Labrador – when you are there, there is also a vaguely perceptible “other world” sense about the place. I was thinking this as I drove the new 2019 GMC Sierra from St. John’s through the Avalon Peninsula on my way to Conception Bay. Perhaps this is why GM chose the “Rock” for this debut. They very much want to present the Sierra as having a different feel from other brands, but mostly from its other in-house version, the Chevy Silverado. 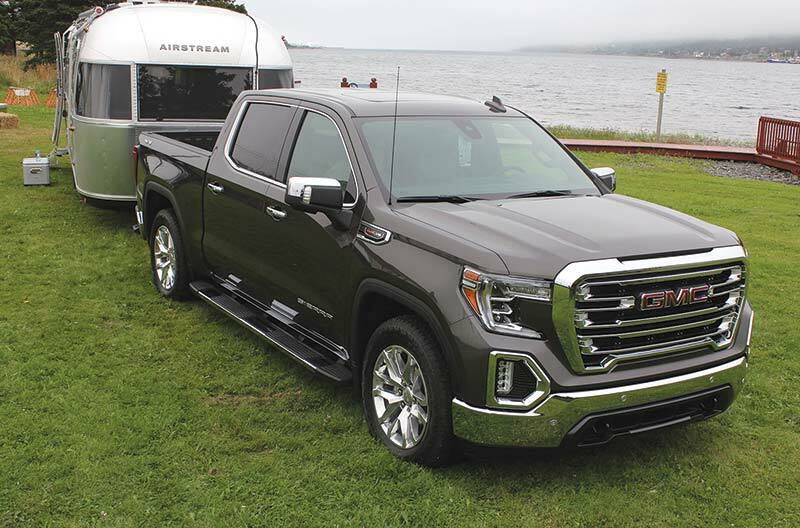 The Sierra’s big sister, which is also new this year, has in some ways stolen the Sierra’s thunder by debuting first; it was rolled out as part of the 100th anniversary celebrations for Chevrolet trucks. So, while this later Sierra release could be considered a second act, there are aspects of the Sierra that do make it different. These are vaguely perceptible at first, but then, like Newfoundland itself, they make themselves known in a way that’s indelible. 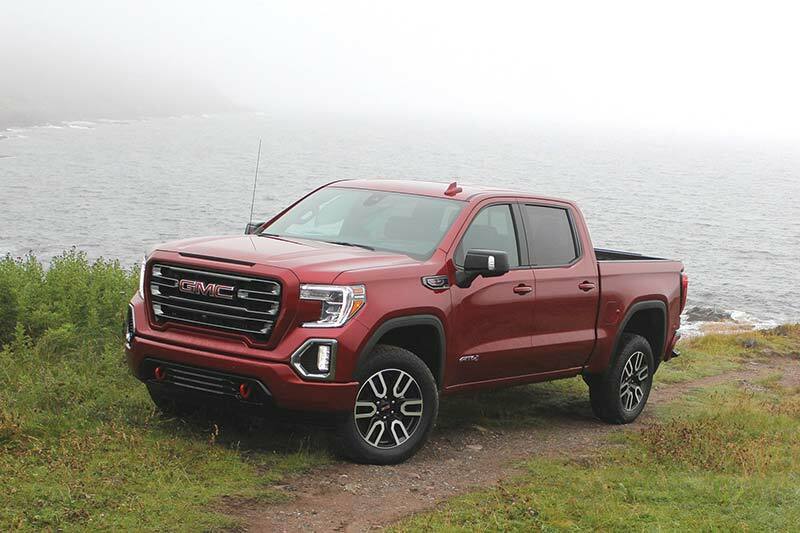 Style-wise, Sierra continues its separation from the Silverado – a direction that started well over a decade ago. 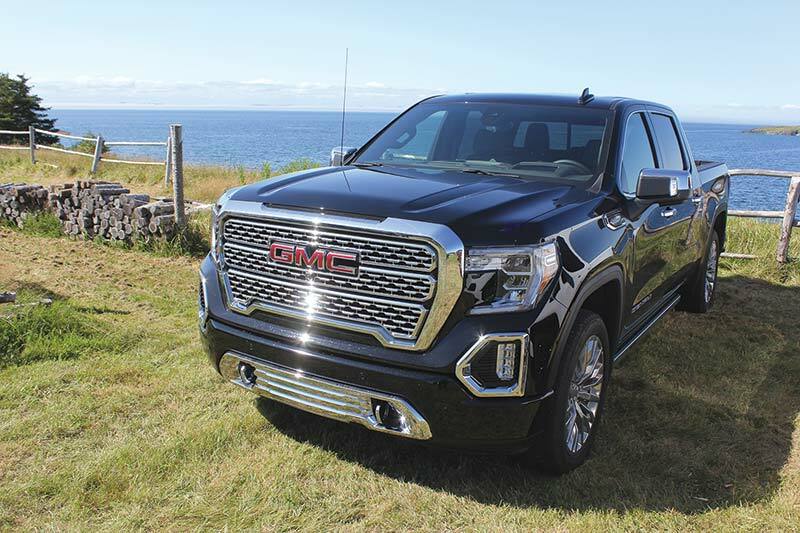 For 2019, the new grille is upright and dominant with a proportional chrome three-bar pattern (Denali, though, continues to get the exclusive “cheese grater” look). 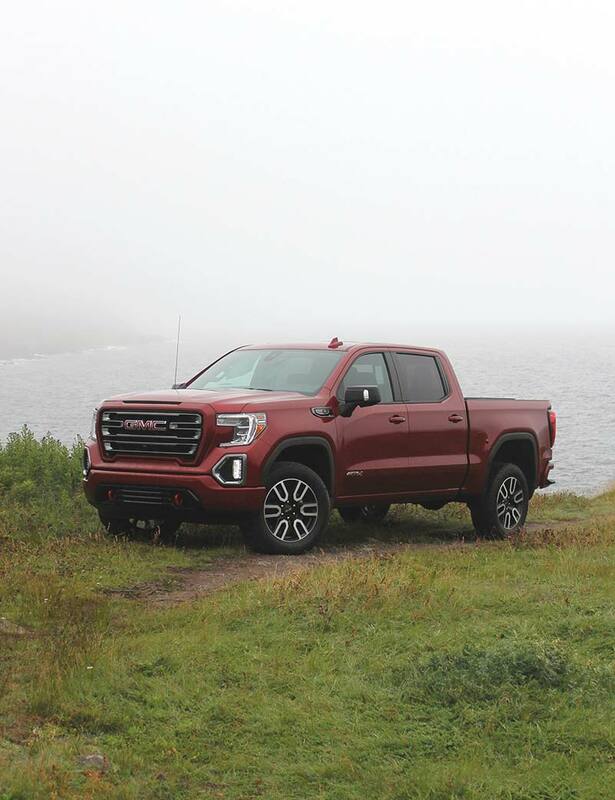 The new lights are large and C-shaped, anchoring the taller hood to the powerful shoulders on the truck’s front end. The wheels have moved closer to the body corners, making it “look” that much longer. 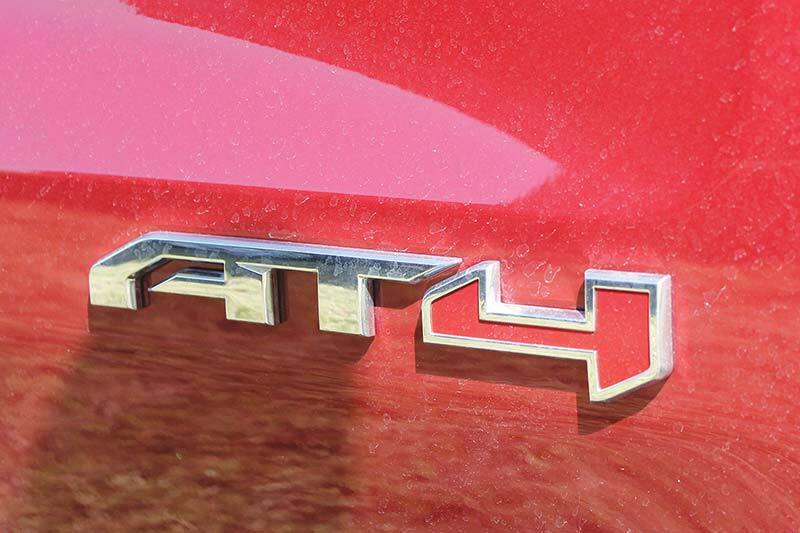 These body features are in sharp contrast to the slick, flatter, pulled back look of the new Silverado. 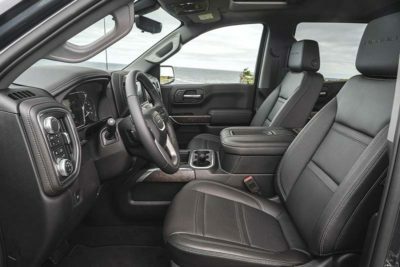 The truck body is actually larger than the old model, with the small space increases mostly being devoted to the interior comfort of passengers. For instance, the 2019 Crew Cab has nearly three inches of additional rear-seat legroom compared to the previous model. 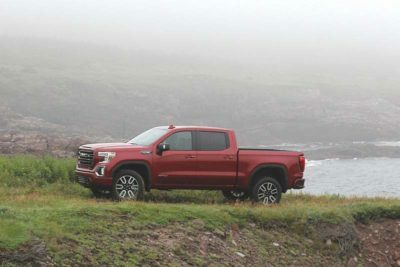 Other new exterior design elements include bright chrome side window surrounds, integrated dual exhaust tips and a wider range of available tires (18, 20 and 22-inch options). Still, while the look matters, if you want to set a product apart from its competition, you have to give it exclusive features. 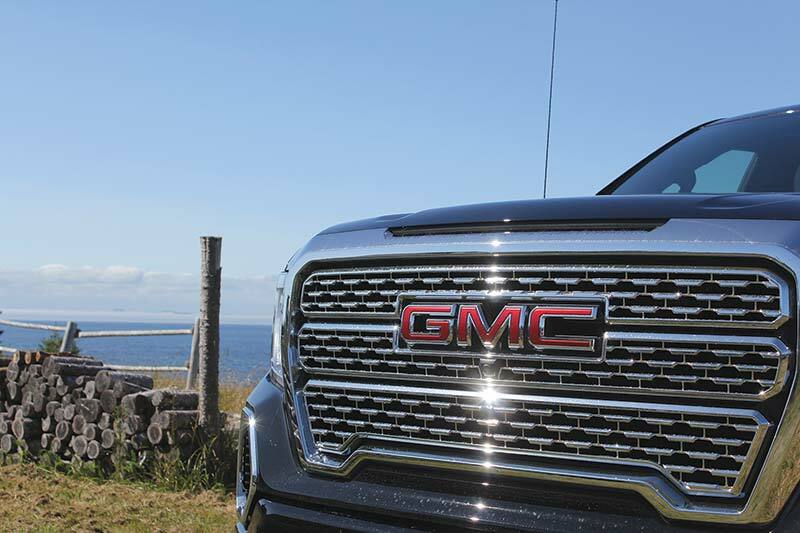 GMC has now done that. Starting at the business end of this new truck, you’ll see that GM has invested in two very unique new features, neither of which will be shared with Silverado. First, a convertible tailgate with multiple functions, and second, an industry-first carbon-fibre cargo box. 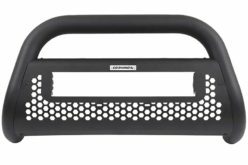 The new convertible tailgate is called the MultiPro. 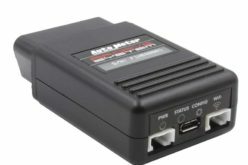 It features six unique functions and positions. The key is the split function that folds half the gate down to create a second tier for loading and/or to be used as a backstop for long cargo. 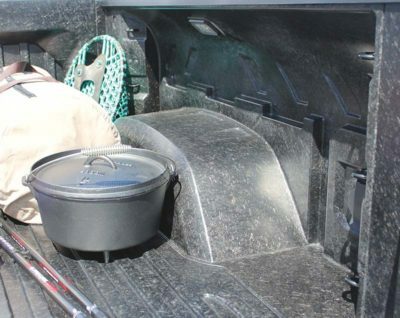 If the tailgate itself is down, the split function now creates an extra-wide step up into the cargo bed, as well as a cut-out for closer bed access. 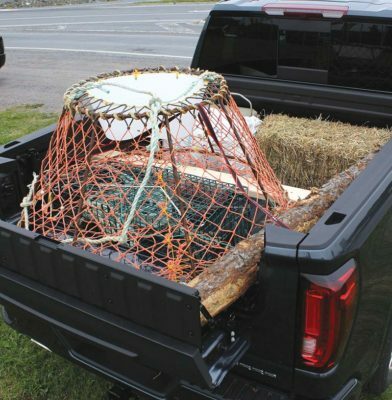 The weight capacity is 375 pounds and the tailgate will also function as a workstation. This fits nicely with the addition of an 110V outlet added to the box nearby. This tailgate will be standard equipment on Denali and SLT trucks. Working with the tailgate at our lunch stop, it struck me that these innovations are the inevitable next-level evolution of the one-piece tailgate. 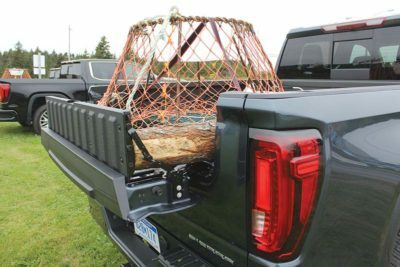 I mean, ever since the early days of trucks, tailgates have doubled as work benches, picnic tables and bleachers. 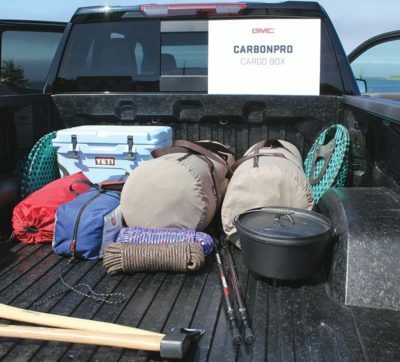 We have always used them for more than just keeping cargo in the bed; now, the GM engineers have made it easier and more convenient to do what we’ve always been doing. The second big deal is this new formed one-piece bed that uses purpose-specific carbon-fibre composite. Once complete, it is 62 lb lighter than the base steel version on the Sierra. 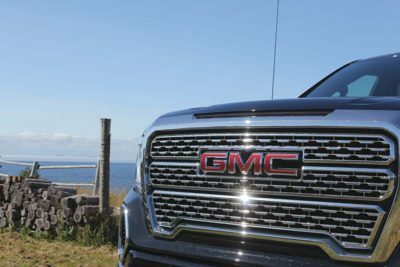 GMC is claiming best-in class dent, scratch and corrosion resistance for this innovation – and with good reason. Carbon-fibre is one of those materials normally associated with high-performance race cars and fighter jets. 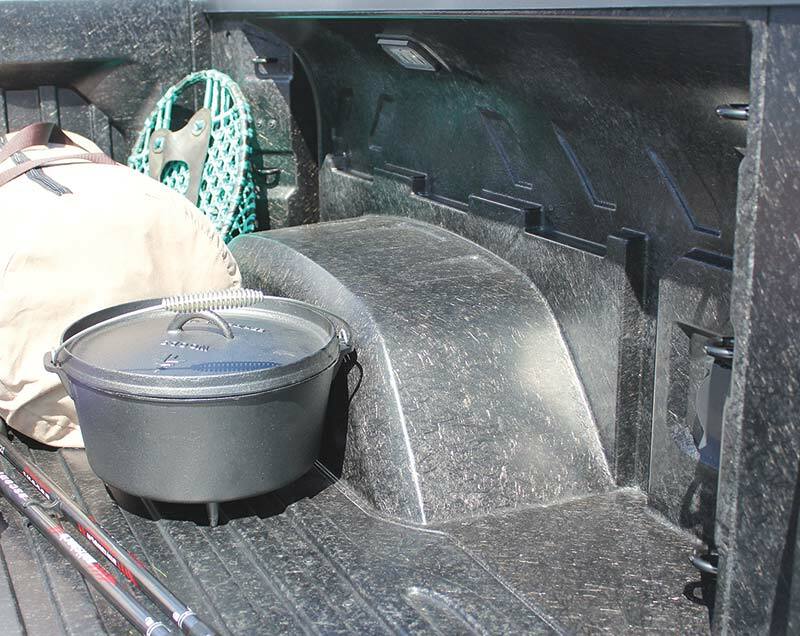 It’s very strong, yet very light – both traits that will benefit any truck cargo bed. This box, called the CarbonPro, is not a standard feature and it will cost more as an option. The standard bed continues to be made of roll-formed steel. This is where it remains to be seen how much value customers are willing to pay for a truck bed. However, having the option is revolutionary. This material is tougher than steel or aluminum. Putting a hole through it is virtually impossible – but should it happen, it can be repaired with a propane torch. When I first saw this bed in Detroit, I had a chance to speak to a director of the company (Continental Structural Plastics) that developed this bed for GMC. We talked about how tough it was and he told me that one of the tests they had subjected it to was loading a snowmobile with a steel-pick studded track into the truck bed, starting it and then pinning the throttle – spinning that track – in place, with those hardened 2-inch steel picks tearing at the floor. This uniquely Canadian-ish torture test did not damage the material. Personally. 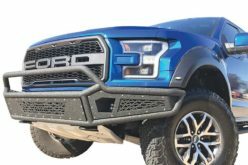 I can tell you I have shredded steel, aluminum and bed-liners doing the same thing – well, actually trying not to. For power – this is where GMC and Chevy do share – new versions of the 5.3L and 6.2L V8 engines will be joined by an all-new 3.0L inline-six turbo diesel engine (very late availability). The 6.2L and 3.0L engine will be paired to a 10-speed automatic transmission. But past the usual updates, GM has unveiled a new fuel saving system called Dynamic Fuel Management. 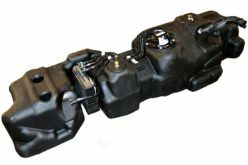 This industry-first technology enables the engine to operate in 17 different power patterns (using from two to eight cylinders) all governed by demand. DFM will be available on both the 6.2L and the 5.3L V8s. Driver-assist technologies are new and found throughout the new Sierra. Key among these is an electronic trailering system called ProGrade. Included in its features is a hitch-view camera with zoom feature for hooking up; side-view cameras to see down the side of the truck and trailer; also an auxiliary camera may be mounted on the back of the trailer for an in-cab view of what’s behind you. A nice touch is a new Auto Electric Parking Brake Assist which automatically applies the parking brake as you shift into park; preventing that one-inch lurch that takes you off the ball. 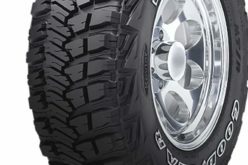 Also part of the package are wireless tire pressure sensors that when installed on the trailer wheels relay tire pressure and temperature information to the in-cab trailering screen. 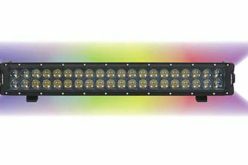 A new trailer light test and diagnostics system is included too. Inside, the Sierra offers another industry first. A 3×7-in. heads-up display projecting vehicle info onto the windshield within the driver’s sight-line. 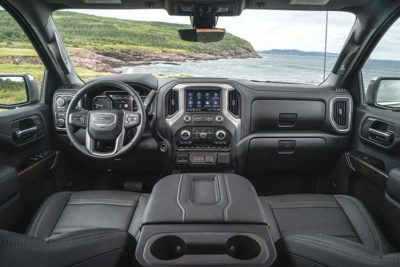 The standard 8-inch infotainment screen offers a new Smartphone-like experience, faster responses and improved voice recognition. This screen also stitches various camera angles together for a bird’s-eye view of the truck. Also new is Adaptive Ride Control (offered on Denali). Using real-time monitoring of road and driver inputs, it reacts (in milliseconds), adjusting shock damping on-the-fly for the smoothest ride. 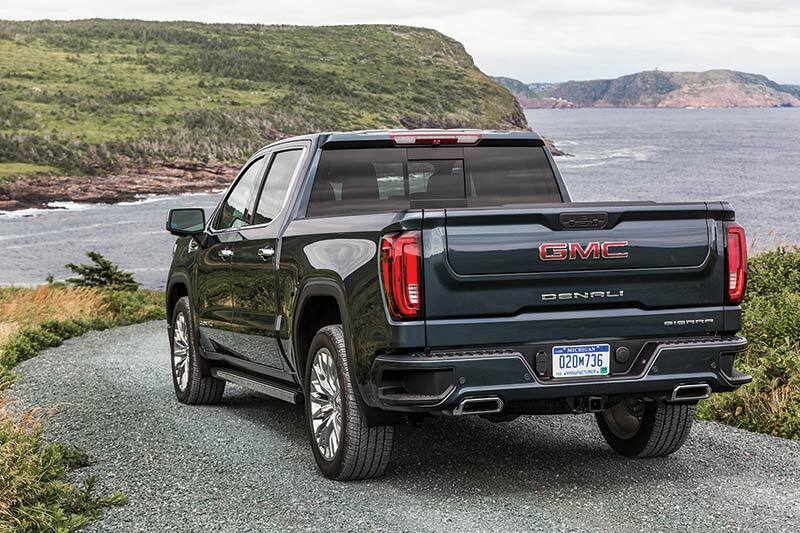 No conversation about a Sierra would be complete without talking about the Denali trim package. Since its debut in a 2001 Sierra, it’s taken on a life of its own. This organic marketing coup happens only occasionally in the automotive world; GM knows it and is working to exploit it. They are pumping even more upscale styling and materials into the truck and expanding its stand-alone character by including a prominent Denali nameplate on the tailgate. 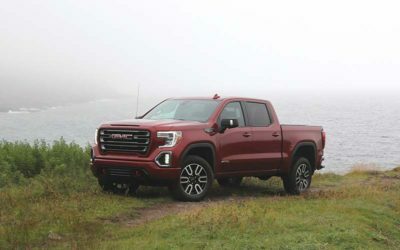 For the off-road crowd, GMC has decided to add a new Sierra spin-off, the AT4. 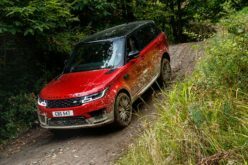 It is billed as a premium vehicle that holds its own off the beaten path. 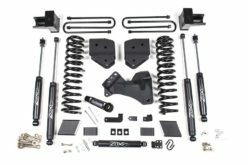 To that end it gets a 2-inch factory lift, upgraded Goodyear DuraTrac tires (up to 20-inches) and an overall look that can best be described as “blacked-out.” These cues come on top of the standard off-road features of Sierra, namely, Rancho shocks, locking rear diff, two-speed transfer case, skid plates, traction select system and hill descent control. 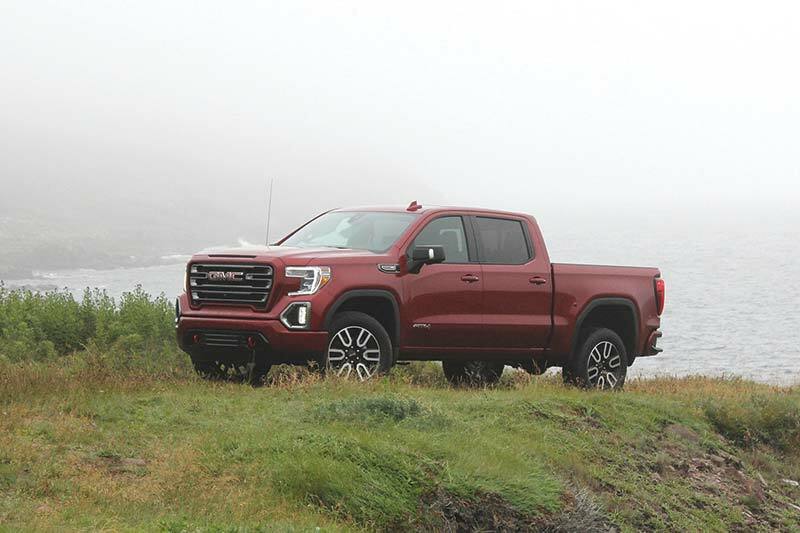 Pricing for the new 2019 GMC Sierra has not been released yet. It’s due in showrooms late this fall.